A fun filled zombie fest that features lots of elements from the game, most notably the over the top weapons. Gory, violent - your typical zombie film. 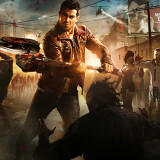 As Dead Rising: Watchtower begins, viewers are treated to an action packed sequence where zombies are rampaging and one man holds his own against them…but only for so long. Just as a killer clown seems unbeatable, the scene cuts to hours before and we begin to get a sense of what is happening. A zombie outbreak has broken out in East Mission, Oregon. Unlike you’d expect, it isn’t cause for major alarm, and that’s all thanks to Zombrex. You see, the whole zombie thing is caused by a virus, and scientists figured out a cure of sorts after the last outbreak. As long as virus carriers take their daily dose of Zombrex, they stay human – no brain eating zombies to be found. And so, East Mission is quarantined until the zombies can be rounded up and dosed, but it isn’t a cause for major panic. The story is told from two perspectives – that of dashing Chase Carter inside the quarantine zone, a young reporter hoping for a viral story that will rocket him to fame, and that of a newscaster outside of the action. She is joined by Frank West, played to hilarious effect by Rob Riggle. West is the guy who wrote the book (literally) on surviving zombie outbreaks, and so joins the newscaster through the entire film as a guest expert. The newscast sequences serve well to heighten the action in the film in several ways. The scene often cuts to the news right when something big is about to go down, so it really brings the suspense up a notch. The newscasts are also often downright hilarious, with Riggle playing up his swaggering hero/straight talk man to the hilt, and that breaks up the tension caused by all the zombie killing that starts to go down when it becomes apparent that the Zombrex is no longer working. As evacuation is abandoned and the city is sealed, Chase is separated from his camerawoman and joins up with an experienced zombie fighter and a grieving mother. Their survival depends on his connection with the camerawoman, who fights for a way to get them out. Dead Rising: Watchtower is nearly two hours of gory zombie killing action, laced with plenty of good humor to keep things light. But this isn’t a movie that’s just in it for the gratuitous violence (although don’t worry – there’s plenty of that too). Dead Rising: Watchtower unfolds a sweeping conspiracy that keeps you guessing right up till the end…and fans of the video game series will love every minute of it.